VMG3925R - VDSL2 Combo WAN (VDSL+GbE WAN) Modem w/4 Port Ethernet 802.11AC/N IPv6 ADSL2+ Fallback AC1600. For Self Install. 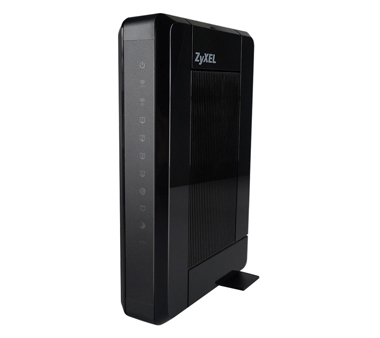 Zyxel’s VMG3925 AC1600 VDSL2 Combo Gateway provides the latest in VDSL2 performance with vectoring up to profile 17a. Vectoring decreases crosstalk for increased bandwidth enabling rich multimedia experiences at longer subscriber distances. 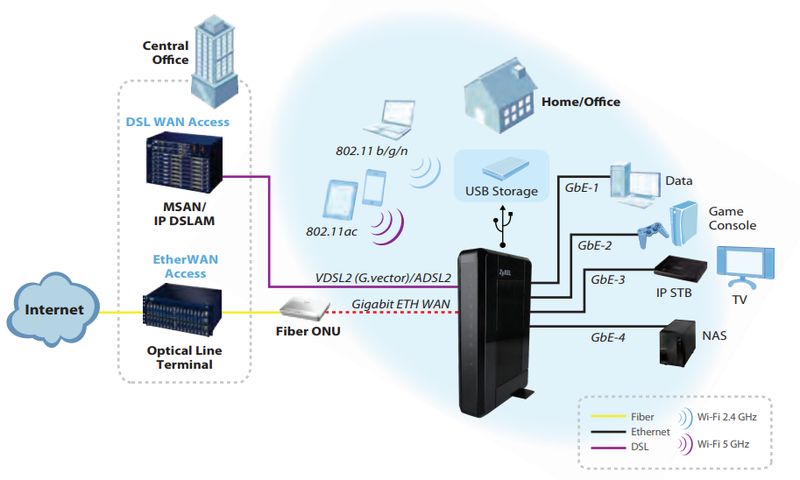 The VMG3925 gateway offers excellent reliability and deployment flexibility with VDSL2 and ADSL2+ fallback as well as PTM/ATM mode support, with full auto-detection selecting the optimal connection type within either modern or legacy network environments. Intended for fiber deployments, the VMG3925 includes a dedicated gigabit Ethernet Combo WAN port with non-blocking routing performance. This enables operators to use a single CPE for both copper and fiber networks and planned migrations. When deployed in a copper network, the gigabit port can be used as a fifth LAN port. The VMG3925 AC1600 VDSL2 Combo Gateway features carrier-grade high-powered dual-band wireless 802.11ac and 802.11n wireless technology to deliver high speed performance and extended coverage. 802.11ac brings leading-edge WiFi to your customer's homes, enabling todays high-bandwidth portable devices with ease. Wireless data rates can reach 1300Mbps* over 5GHz and 300Mbps* over 2.4GHz with stable, reliable wireless connections virtually eliminating dead zones while extending coverage to remote areas throughout the home. Additionally, four Gigabit Ethernet LAN ports operate at wire speed for speedy data transfers within the home. Zyxel engineers excellent routing capabilities designed to meet service provider needs. The VMG3925 gateway continues this trend with full IPv4 support, IPv6/IPv4 Dual Stack, and IPv6 Rapid Deployment (RD) for a strong foundation. Upon this foundation, Zyxel implements advanced features including TR-069 remote management and device configuration, quality of service (QoS) functionality to categorize incoming and outgoing traffic, and a stateful packet inspection (SPI) firewall for end user security. Download the Zyxel VMG3925 Datasheet (PDF).